Depart from your hometown for Holy Mount Kailash Yatra and arrive at Kathmandu Airport today. On arrival you will be transferred to your hotel by our company’s representative. Dinner and stay at your hotel in Kathmandu. Breakfast will be in the hotel. A visit to Pashupatinath Temple in the morning will be organized for the travelers. The visit may also include Boudhnath Stupa depending on availability of time. In the afternoon you will be transferred with the group to the Domestic Airport Terminal to board your flight to Nepalgunj. On arrival at Nepalgunj transfer by bus to your hotel. Meet with other co-travelers who starts there trip from Nepalganj and night stay at your hotel. The ultimate of your Mount Kailash Yatra awaits for you today. 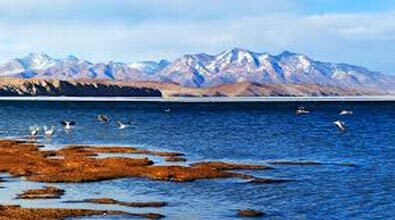 Today you will have the first darshan of Holy Lake Mansarovar. After breakfast we take a drive to Chui Gompa (4560 m) through a rough terrain via Rakshas Taal. 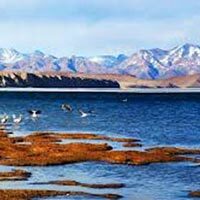 Besides taking bath in the Holy Lake Mansarovar you will also have free time for puja and havan at your own cost (on Full moon trips, it will be a full moon day at Mansarovar). After all this if time permits we will also visit the Hot Spring (additional charges for bathing in Hot Spring not covered in the package). Night stay will be at your guest house in near the lake Manasarovar. After breakfast we drive to Tarboche which is also known as Shershong. Enroute we will visit Yama Dwar. Enter the holy gate and continue further to Tarboche. At Tarboche you will meet Yak and Yak men. This is the starting point of the parikrama and the first day of kora / parikrama / circumambulation. If you wish to hire a Yak and a porter to carry yu and your luggage during trekking of Mount Kailash, you have to take from here only. After finishing the trek you will today have the closest darshan of Holy Mt. Kailash (North face) from Dhirapukh. Today we will stay in a lodge at Dirapuk. Breakfast will be served near the guesthouse/camp and one can enjoy the morning time in exploring the caves, visiting the temples and shrine built around. Here you will see a married old couple supervising the temple. The temple is a residence for over half a dozen Tibetan devotees, helpers or relatives who keep busy themselves busy with the maintenance of the buildings. The cave also contains meditation platforms. Climbing up to these caves before ending the final trek of the holy Kailash Mansarovar Yatra is worth. After a 10 kms / 4-5 hours walk we reach to the final destination of our Mansarovar Yatra trek near Darchen. (Those who could not do parikarma would be waiting to welcome other group members at this point). Our vehicles will be waiting to take the group to the hotel in Taklakot for overnight stay. After breakfast we drive to Sher and descend down to Hilsa by crossing the bridge. From Hilsa the chartered Helicopter will ferry the group to Simikot and stay overnight in guest house. If weather permit we may continue to fly to Nepalgunj for night stay. After breakfast we will be taking scheduled flight to Nepalganj. From Nepalganj connect with your flight to Kathmandu for night stay. After breakfast you will be transferred to the Tribhuvan International airport to board your flight back to home. Your trip concludes and you fly back home capturing everlasting memories of your visit to His homeland.